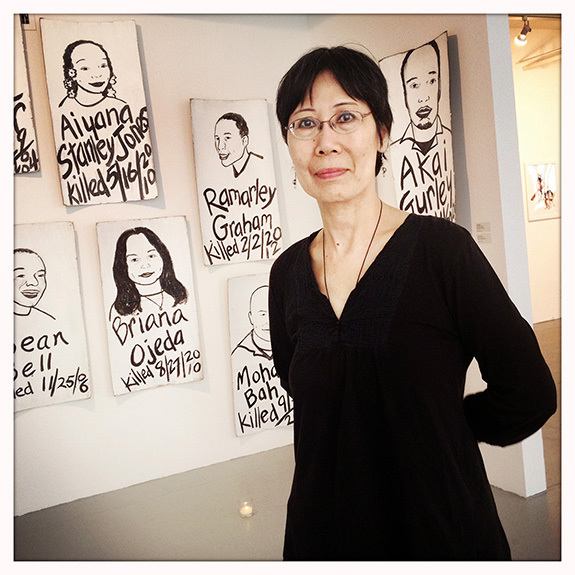 “Culture allows us to dream, to envision what is possible.” Fay Chiang – visual artist, poet, community activist – was one of the co-founders and a long time director of the Basement Workshop, NYC’s seminal Asian American cultural collective. One of the rallying points for her generation of activists were the NYPD’s excessive use of stop and frisk policies targeting young people of color, and the brutal 1975 police beating of Peter Yew. Twenty years later, a police bullet killed 16 y.o. Yong Xin Huang in Brooklyn. Over the past ten years, Fay has created more than 60 portraits of youths whose lives were lost at the hand of police.